Increasing HIV diagnosis is important for combatting HIV. We invited individuals aged ≥ 13 years seeking voluntary HIV testing at Mildmay Clinic in Uganda to undertake a computer or audio-computer-assisted self-interview to facilitate post-test counseling. We evaluated first-visit data from 12,233 consenting individuals between January 2011 and October 2013. HIV prevalence was 39.0%. Of those with HIV, 37.2% already knew they were infected. Undiagnosed infection was associated with not being single, screening positive for depression (aOR 1.16, 95% CI 1.04–1.28), and screening for harmful drinking behavior (aOR 1.23, 95% CI 1.10–1.39). 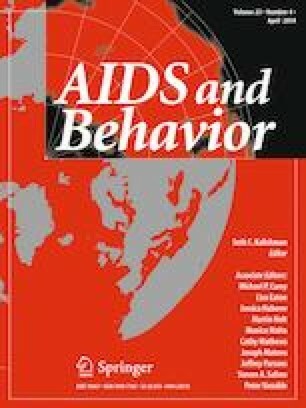 The odds of retesting subsequent to HIV diagnosis were lower for males (aOR 0.80, 95% CI 0.70–0.92) and those screening positive for harmful drinking behavior (aOR 0.77, 95% CI 0.66–0.88). Retesting was also associated with higher education and perceived social status below ‘better off’. Our findings reiterate the value of population-based HIV surveys to provide estimates of testing coverage. Funding for data collection and analysis came from PEPFAR through the US Centers for Disease Control and Prevention under the cooperative agreement number 5U2GPS000971. We thank the staff at Mildmay Clinic who provide an invaluable service to the community as well as the clinic clients who allowed us to analyze their data. The findings and conclusions in this paper are those of the authors and do not necessarily represent the official position of the US Centers for Disease Control and Prevention. WH designed the research with ES, BM, MO (Mary Odiit), and SS. BM coordinated data collection supervised by MO (Mary Odiit) and YK. MO (Moses Ogwal), ES, and SS provided technical support. AH and LH analyzed and interpreted the data. AH, LH, and WH were major contributors in writing the manuscript. All authors read and approved the final manuscript. This study was funded by PEPFAR through the US Centers for Disease Control and Prevention under the cooperative agreement number 5U2GPS000971. This article does not contain any studies with animals performed by any of the authors. All procedures performed with human participants in this study were in accordance with the ethical standards of the institutional and/or national research committee and with the 1964 Helsinki declaration and its later amendments or comparable ethical standards. UNAIDS. Uganda, UNAIDS 2016. http://www.unaids.org/en/regionscountries/countries/uganda/.